It’s common knowledge that vegetables are good for you. Along with providing a host of nutritious vitamins and minerals, vegetables help guard against disease and even encourage healthy weight maintenance. Those are great reasons to keep them on your plate at every meal. But, other food groups are equally important, and neglecting them could negate the benefits of eating lots of vegetables. Most Americans get less than half the amounts of vegetables and fruits that the government recommends. Those suggested amounts are 2 1/2 cups of vegetables and 2 cups of fruit daily, based on a typical 2,000-calorie diet. Eating that many vegetables or more can contribute to significantly reducing your risk of several serious health conditions, including diabetes, stroke, heart attack, heart disease, high blood pressure, kidney stones, bone loss, obesity and cancer. Maintaining a high vegetable intake can even reduce your overall mortality risk. Vegetables provide generous amounts of carbohydrates, dietary fiber, vitamins and minerals. However, most vegetables don’t contain a lot of protein or fat. Proteins build and maintain healthy cells throughout your body and are required for muscle protein synthesis, the process of building and repairing lean muscle mass. Fats provide energy, are critical for brain growth and development and make it easier for your body to absorb many of the vitamins and minerals from vegetables. Soybeans are a complete source of protein and many other beans and legumes are rich in protein, and avocados and olives are healthy sources of fat. However, you may have trouble meeting daily protein and fat recommendations if your sole sources of those nutrients are vegetables. Following a veggie-only diet may also lead to vitamin B-12 deficiency, since there are very few plant-based sources of B-12. Not getting enough protein, fat and vitamin B-12 isn’t likely to significantly impact your health on a short-term basis, but long-term deficiencies can be more serious. Severe protein deficiency may produce symptoms of muscle and joint pain, swelling, hair loss, dry skin and hair, cramps, ulcers, headache, nausea or depression. Not getting enough healthy fats can produce some similar symptoms as well as decreased immunity, acne, arthritis, poor concentration and irritability. Finally, being deficient in vitamin B-12 may lead to severe depression, cognitive decline, anemia, paranoia, delusions, shortness of breath, memory loss or incontinence. You may be able to prevent some nutrient deficiencies by taking supplements or multivitamins while following an all-vegetable diet. However, supplements aren’t able to provide the same high nutritional quality as whole foods, so they may not be as effective at providing the “balance” you’d be getting with a balanced diet. A healthier alternative to eating all vegetables is to increase your daily servings of vegetables while still eating moderate amounts of foods from other main groups. Before you make any major changes to your diet, get approval from your doctor. Elephant Journal: Could You Be Protein Deficient? Care2: Are You Deficient in Healthy Fats? MD Anderson Cancer Center: Whole Foods or Supplements? What if a Person Eats Too Many Vegetables? 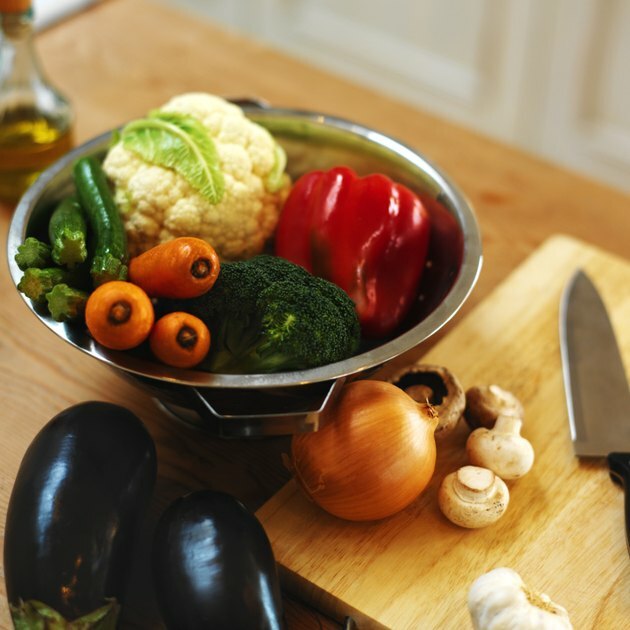 Can You Lose Your Fat From Just Eating Vegetables for a Month?